The hypotenuse is the longest side of the triangle and is opposite of the right triangle. There are also legs to a triangle. Using the Pythagorean Theorem, 'a' and 'b' are the lengths of the two legs of a right triangle, while 'c' is the length of the hypotenuse. Is the Triangle a Right Triangle? Let's say that in our example, we are told to determine whether the triangle is a right triangle or not. 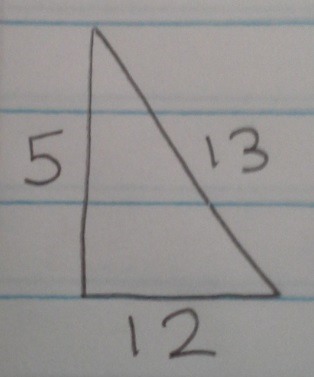 A picture of the triangle and its side lengths is given to us. 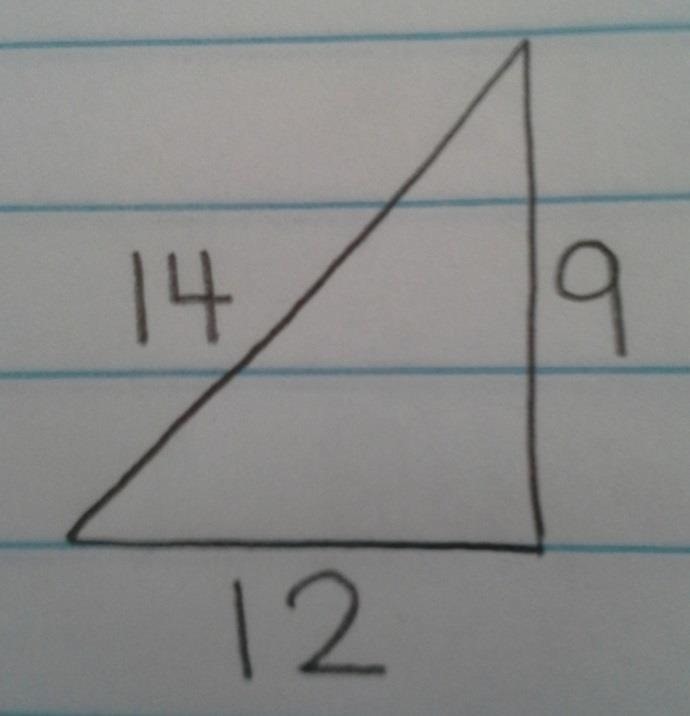 To figure out if the triangle is a right triangle or not, we need to use the Pythagorean Theorem. We use the equation a^2 +b^2 = c^2. Using the side lengths we are given, we know that a = 5, b = 12, and c = 13. Now all we have to do is complete the current equation which is 5^2 + 12^2 = 13^2. After solving the equation, our final answer is 169 = 169. Since a^2 + b^2 does equal c^2, we know that this triangle is a right triangle. In the next example, we will also determine whether or not the triangle is a right triangle. We are given a picture of the triangle and its lengths. From the picture, we know that a = 9, b = 12, and c = 14 and using the Pythagorean Theorem, we know that the equation that we need to solve is 9^2 + 12^2 = 14^2. Once it is solved, we know that 225 does not equal 196, meaning that this triangle is NOT a right triangle. 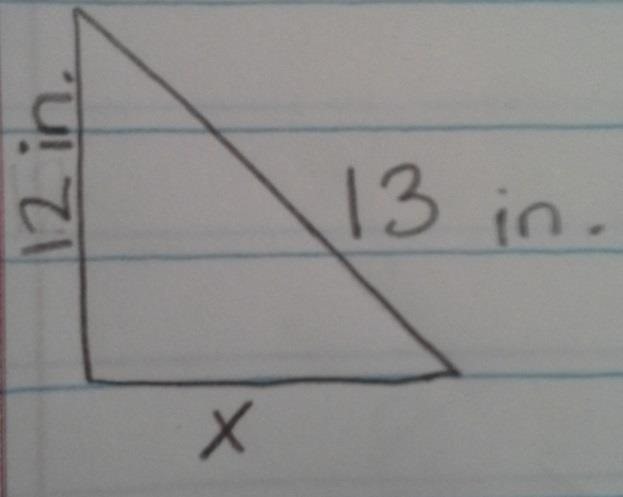 The Pythagorean Theorem can also be used to find missing side lengths. In this example, we can gather information given to us from the picture below. We know that a = 12, b = x, and c = 13. We plug all of the numbers into a^2 + b^2 = c^2, the Pythagorean Theorem. 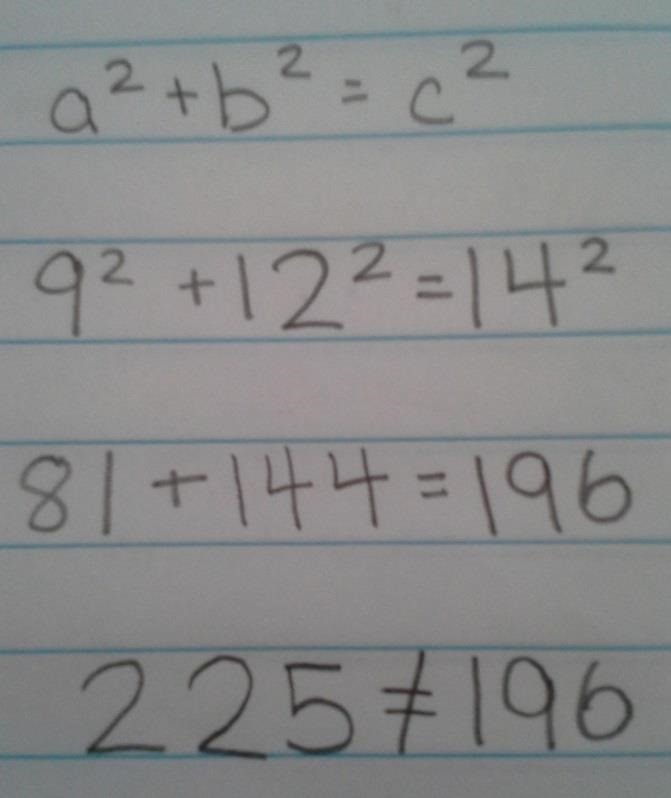 We need to find out what b is equal to by solving the equation, 12^2 + b^2 = 13^2. After making calculations, we find out that 12^2 is equal to 144 and 13^2 is equal to 169. The current problem is now 144 + b^2 = 169. We need to get 'b' by itself, also known as isolating the variable. 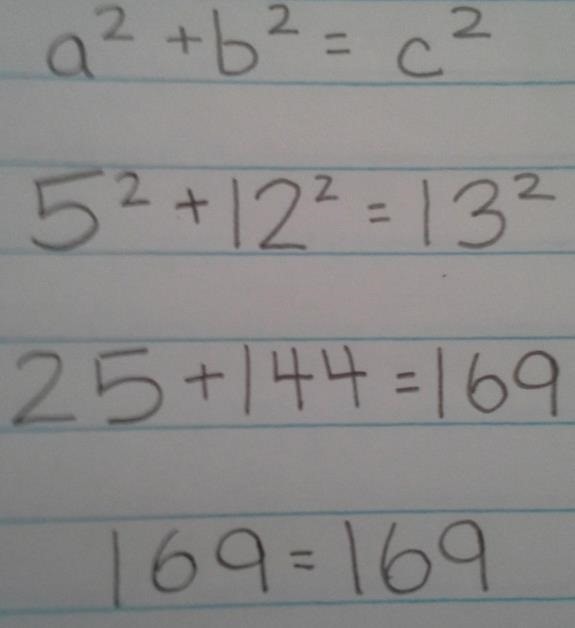 To do so, we subtract 144 - 144 and 169 - 144, since whatever you do on the side of the equal sign also has to be done on the other side of the equal sign. Now, b^2 = 25. How do we find out what 'b' is when we see that it's squared? Well, it's very simple actually. The opposite of squaring is finding the square root, so that is what we are going to do. We find the square root of b^2 and the square root of 25. Our final answer turns out to be b = 5. Since we know that b = x, we can plug in the number 5 for x. Let's say you want to find the diagonal length of a television screen. The length is 4 inches while the width is 9 inches. We can find the diagonal length by using the Pythagorean Theorem. a^2 + b^2 = c^2. C is the unknown diagonal length. a = 4 and b = 9. The equation is 4^2 + 9^2 = c^2. We get 16 + 81 = c^2, which is then simplified to 97 = c^2. We find the square root of 97 and c^2, which is then 9.84885780179615 = c. We can round the number to the nearest hundreth. Our final answer is 9.85 = c. We now know that the diagonal length of the television is approximately 9.85.